Senior executives from both Facebook and Google are to discuss how they are tackling the phenomenon of fake news at next month’s Society of Editors conference. Patrick Walker, left, Facebook’s director of partnerships for Europe, the Middle East and Africa will join Google director of communications Peter Barron to debate the issue with industry leaders. 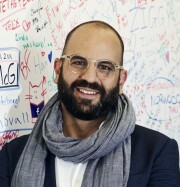 Patrick’s role includes developing content partnerships with media companies in Europe, the Middle East and Africa across news, sports, and entertainment. There have been recent calls for publishers whose content appears on Facebook to be given a share of the advertising revenue garnered by the social media giant. Patrick has also worked as a senior broadcasting journalist for the BBC and Japan and South East Asia as well as leading the development of content strategies and partnerships at YouTube. The session, at Clare College, Cambridge will take place on Monday 13 November, the second day of the two-day media gathering. The conference is sponsored by Camelot, United Utilities, Google, BBC News, JTI, Foot Anstey, PCS, NLA Media Access, Waitrose, Cambridge News, Visit Cambridge and Beyond and HoldtheFrontPage. Booking is now open at https://www.societyofeditors.org/book_now. Is he pictured on the catwalk or was it particularly chilly that day?